NAPLES, Fla. (May 15, 2018) – Nearly 10 percent of all seniors in Florida have been diagnosed with Alzheimer’s Disease, and that problem is about to get worse. That was the warning that Alzheimer’s and dementia expert Dr. Sean Morrison gave those in attendance at a recent gathering organized by Naples philanthropist Patty Baker. “Research shows that by 2025, there will be an estimated 720,000 individuals living with Alzheimer’s Disease in the state of Florida,” said Morrison, the Ellen and Howard C. Katz Professor and Chair of the Brookdale Department of Geriatrics and Palliative Medicine at the Icahn School of Medicine at Mount Sinai in New York. The senior center facilitates eight weekly groups around the county that provide socialization and wellness for Alzheimer’s and dementia sufferers. The groups work on language skills, memory techniques, relaxation techniques, socialization and self-esteem building through concentration and memory activities, art and music therapy, and more. Caregivers learn the tools they need to provide better support for their loved ones, relieve stress and manage daily activities through the senior center’s new caregiver boot camps, modeled after programs designed by UCLA researchers. The first boot camp, held in March, drew rave reviews from those who took part. Baker put together the luncheon gathering to promote awareness of the resources available through the Naples Senior Center at JFCS. Nearly three dozen key influencers attended and met with Dr. Jaclynn Faffer, President/CEO of the Naples Senior Center at JFCS. 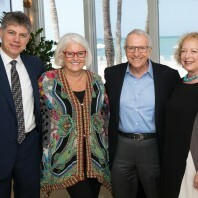 That personal connection led Baker’s husband, Jay, to join the Naples Senior Center at JFCS Board of Trustees this month. To learn more about the dementia respite support groups offered through Naples Senior Center at JFCS, call geriatric social worker Rhonda Eisenberg, LMHC, at 239-325-4444 or email her at reisenberg@naplesseniorcenter.org. For more information about the center’s caregiver boot camps, call 239-325-4444 and ask for Anne Chernin.